Prebiotics – Have you fed your ‘good’ gut bacteria today? Gut health is all the rage these days and although you’ve probably heard of probiotics, you may not be as familiar with prebiotics. They go hand in hand: one is a live, healthy microorganism (probiotics) and the other is the food they eat (prebiotics). You need both for optimal gut health! They go hand in hand: one is a live, healthy microorganism (probiotics) and the other is the food they eat (prebiotics)…you need both for optimal gut health! But what are Prebiotics? They are a type of indigestible fibre that is found in certain plant foods. When we eat these foods, they pass through our gastrointestinal tract undigested until they reach the colon. This is where your ‘good’ gut bacteria hang out and they LOVE this stuff! These bacteria break down (ferment) the fibre to use as food, allowing them to grow and repopulate and in turn improve both our gut health and our health overall. When our diet is lacking in prebiotics and we eat more highly processed, fatty, foods we end up starving our good bacteria and feeding bacteria that are less beneficial to our health. 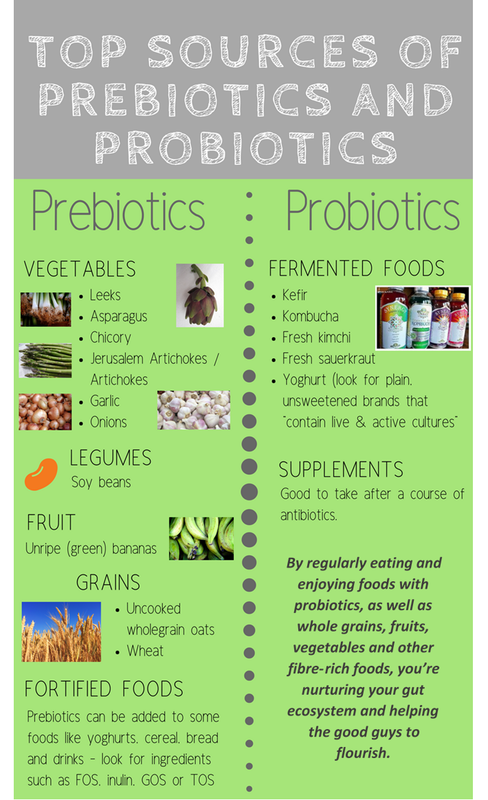 Aside from helping out your ‘good’ gut bacteria, there are so many other benefits of prebiotics! Lowered risk of cardiovascular disease and coronary heart disease. Lowered risk of type II diabetes and improved insulin control. Decreased risk of colorectal and bowel cancer. Weight loss and weight maintenance. Improved digestion and gut health – making it easier to go to the toilet! Better nutrient absorption – especially calcium and magnesium. Natural detoxification and improved skin health (who needs to spend $$ on a facial!). Mental health benefits and stress management. However, before you load up your plate with prebiotic-rich food a word of caution: as plant fibre is tough for your body to break-down and digest, adding too much fibre to your diet at once may cause issues such as gas, bloating and abdominal cramping. If you have been eating a diet high in processed foods (which have very little fibre) or already have gastrointestinal issues, it is advisable to add prebiotics to your diet gradually, in small amounts. Listen to your body – everyone has different levels of tolerance. Aside from starting slowly, with small amounts of prebiotic foods, try increasing your water intake as well. If you are suffering from these issues you may benefit from seeking support from a nutritionist or other accredited dietary professional. So the next time you grab a Kombucha, maybe think about sending down a little packed lunch to fuel those good bacteria and prepare them for the battleground in your gut! This article is not intended to substitute for informed medical advice. You should not use this information to diagnose or treat a health problem or condition. Always check in with a medical practitioner before making drastic changes to your diet, taking supplements or starting a new fitness routine. Gibson, G. r. et al. (2017) The International Scientific Association for Probiotics and Prebiotics (ISAPP) consensus statement on the definition and scope of prebiotics. Nat Rev. Gastroenterol. Hepatol. Doi:/nrgastro.